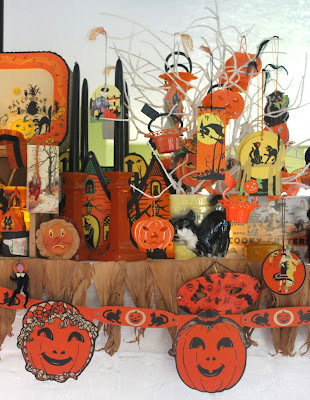 Happy Holidays: My Hallowe'en mantle display for 2011! 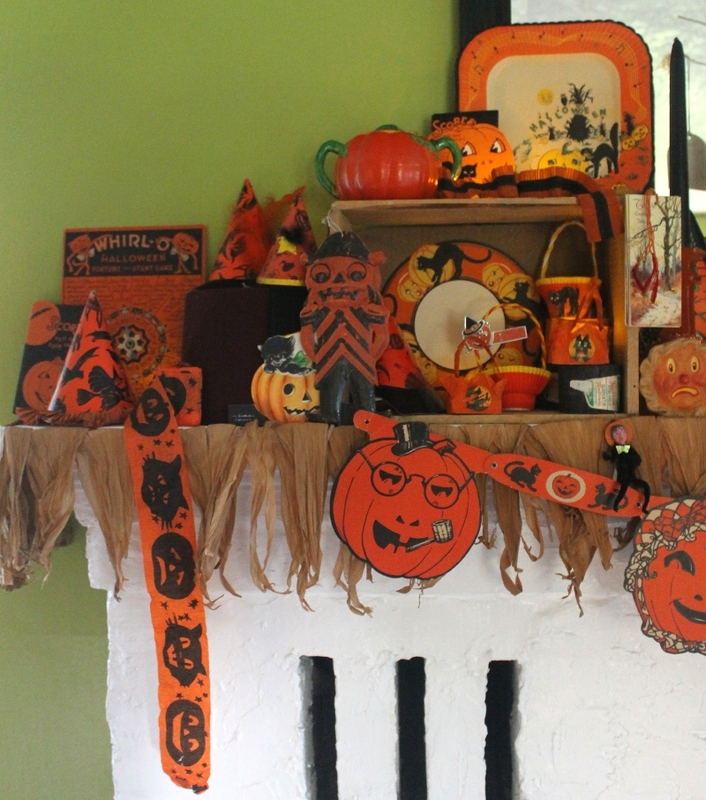 I didn't do a Hallowe'en display in the hallway this year. I not only didn't have time but all of my fall foliage that I use is in an Autumn window display at Hillside Shopping Centre. Here is this year's mantle display. I have a few other items tucked on some shelves but with a two year old grand daughter everything has to be kept up high! The images are fairly large so that you can have a better look when you click to enlarge them. 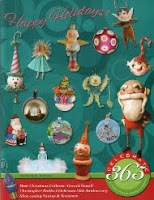 I picked up a lot of these decorations about 8 years ago. The items would turn up at the different thrift shops. I have a good friend that collects holiday items as well and when she is in the US she will find a few things for me to add to the collection. That dark burgundy area that has two party hats on it is a genuine fez. For some reason I associate the fez with Hallowe'en. 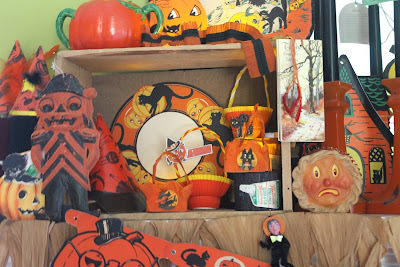 I picked up one of Amelia Schaefer's pie candy boxes at the Hallowe'en and Vine show when I was there. He's great! I had some unpainted white wire branches that I had made earlier in the year so I plonked them into a vintage florist vase. I really like this vase; I'm not sure if it is a Hallowe'en item but it works for me. The black cat is curling around a yellow wooden bucket that is probably filled with fish! Most of my bridge tallies and plastic nut cups are hung from the branches. This little vignette shows off my US zone Germany witch candy container, a velvet black cat, a ceramic stump vase and a thin wooden board with the Cornish Litany burned into it and then painted with opaque watercolours. The technique of decorating wooden objects with a wood burning tool is known as pyrography. This last close-up shows Lori Rudolph's great teapot that I purchased at Hallowe'en and Vine this year. Behind the black cat teapot is a 1923 Butterick pattern for a Pierrot costume. Just below and to the left of the black cat teapot is a wind-up black cat that is chasing a butterfly. That probably isn't a Hallowe'en item either but as I said before, "It works for me!" I'll show you the Autumn window display in my next post. What a collection! You've made me so nostalgic that I wish I was going out trick or treating. Oh, for the good old days. 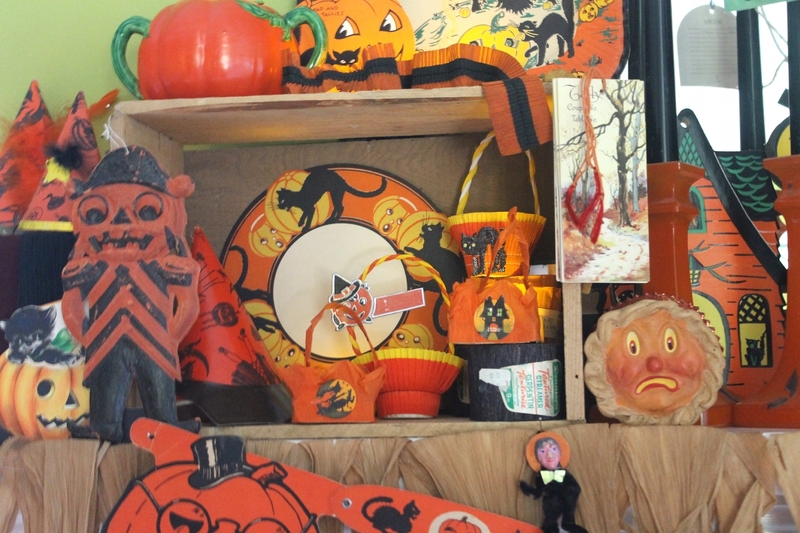 I have a roll of the crepe paper streamers with pumpkins, too. Enjoy your weekend Len and thanks for sharing your decorations. Your mantle looks great! You may not think it's much, but you've sure got a heck of a lot more than me. I'm not able to make it to show's, although I'm really shooting to do one in 2012, so I don't get to see other artists work in person. You've got a great collection going, and to tell you the truth it's kind of refreshing to see a man collect the same kind of stuff I like, and most of the other women out there blogland. Stop by and visit sometime, I'd love to hear from you. Catherine, I wish that adults could go trick or treating as well! Meri, I will be by. It has been a while, my apologies. I noticed that you live in Phoenix. Amelia Schaefer of Sweet B Folk Art lives there as well. She was at H&V this year. you should try and get to the show, it is amazing! Thanks Deb and Jen for the compliments. I do have quite a bit more Hallowe'en decorations but the problem is that I don't have the room to display everything.